Thanks so much to everyone at JD! Have a healthy and happy Thanksgiving! Same to you and your families – it’s always a pleasure working with you. Thank you, Murray. We feel the same way! We love working with you and your organization. Thank you for the kind words. 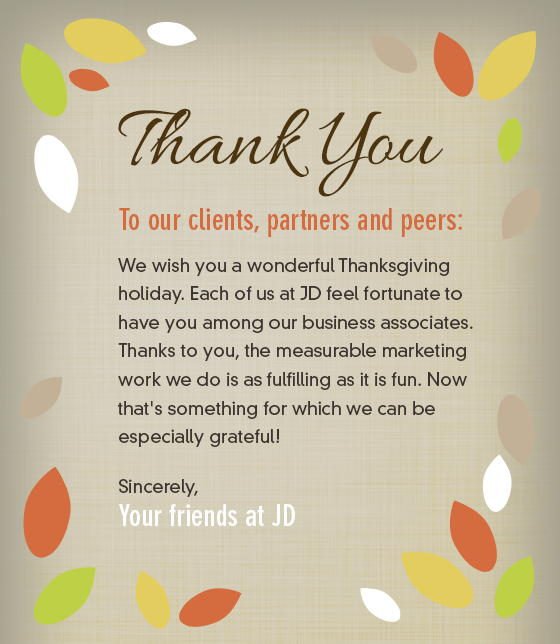 Happy Thanksgiving to our good friends at Johnson Direct. May your day be enjoyed with smiles and laughter. We appreciate the measurable results you have provided the Milwaukee Water Works, drip by delicious drip! Cheers!